Is this the PSP2? We think not. 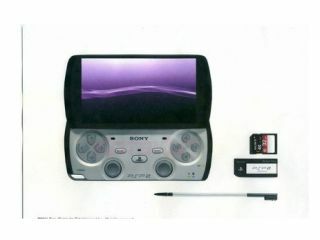 Squeezing as many last minute rumours out of the PSP2 as possible before its official reveal on 27 January, a photo posing as an official hand-out detailing the device has made its way online. While many sites have been eager to suggest this is the illusive new gaming device, we are just as eager to point out that it probably isn't. We'd expect more from Sony than these scrappy handouts and, quite frankly, we're hoping for a better looking PSP2. This version looks a lot like the spy shots of the PSP phone prototypes that have been floating about for some time. Accompanying the suspicious device are a stylus, SD memory card and a PSP2-branded memory stick. As some sites have pointed out, the PSP2-branded stick is based on an old PlayStation design; Sony is unlikely to go back to this legacy look. Making these images into a picture of a handout rather than an original digital file also helps to hide key evidence of Photoshoppery, like the changes in resolution of an image that has been cobbled together from other pictures. So, basically, it's probably not the PSP2, rather the work of some eager young Photoshop aficionado. But hey, we'll know for sure in just two days - until then we're sure the rumour mill will keep turning.